This is a good article about constant expressions and computations at compile time. It gives good coverage of the new constexpr keyword for allowing compile-time and run-time evalution. constexpr is discussed rigorously with information on the rules required by the facility. Release 2012.1 of Applied Informatics C++ Libraries and Tools is now available. Secure remote access to smart devices. A free evaluation version is available for download. Jon Kalb from the C++ Now 2012 conference. Safe usage of exceptions is a non-trivial problem that the industry has struggled with for the better part of two decades. If you have fear, uncertainty, or doubt about exception safety or just want to see the best practices for using exceptions in C++, this session is for you. We'll start with "What is the problem we are trying to solve?" and discuss alternatives, acknowledge the challenges associated with with exception usage, and cover some well-meaning but misguided attempts at safety. I will then present a set of guidelines that are the basis for safe exception usage and solid implementation techniques, including how to transition from an exception-unsafe legacy code base. This fragment of code prepares a vector of HugeObject (e.g. expensive to copy) and returns a lambda which uses this vector (the vector is captured by copy because it goes out of scope when the lambda is returned). Can we do better? 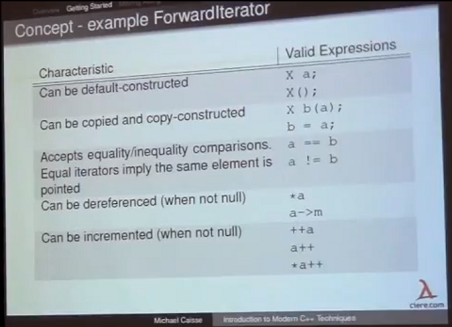 Brilliant talk from Michael Caisse from C++ Now 2012. In C++, two of the most used data structures are std::vector and std::list. In this article, their performance is compared in practice on several different workloads. It is generally said that a list should be used when random insert and remove will be performed (performed in O(1) versus O(n) for a vector). If we look only at the complexity, search in both data structures should be roughly equivalent, complexity being in O(n). When random insert/replace operations are performed on a vector, all the subsequent data needs to be moved and so each element will be copied. That is why the size of the data type is an important factor when comparing those two data structures. However, in practice, there is a huge difference, the usage of the memory caches. All the data in a vector is contiguous where the std::list allocates separately memory for each element. How does that change the results in practice ? 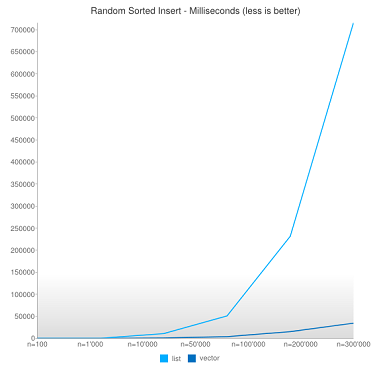 This article shows the difference in performance between these two data structures. 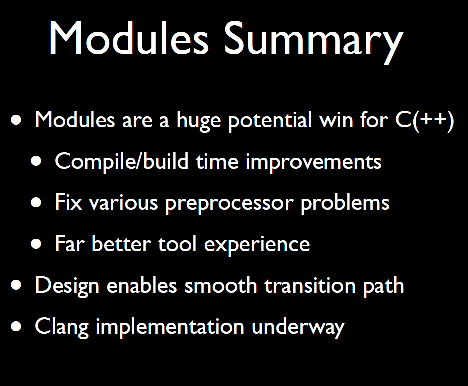 Earlier this month, Doug Gregor gave a presentation on Modules at the November 2012 LLVM Developers' Meeting. Doug is lead Clang developer at Apple, chairs the WG21 Study Group on Modules (SG2), and in this talk reports his design goals and partial progress to date on designing and implementing a module system for C++. This talk is an extended version of the presentation Doug made at the Feb 2012 ISO C++ meeting in Kona. The talk slides and video recording is available via the 2012 DevMeeting page. 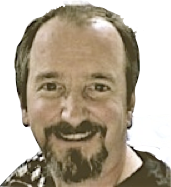 Standardization note: SG2 was formed in February and has been relatively quiet as a handful of experts (notably Doug with Clang) make further progress on proof-of-concept designs and implementations. As this prototyping work coalesces, SG2 is expected to become active early in the new year. The C preprocessor has long been a source of problems for programmers and tools alike. Programmers must contend with widespread macro pollution and #include-ordering problems due to ill-behaved headers. Developers habitually employ various preprocessor workarounds, such as LONG_MACRO_PREFIXES, #include guards, and the occasional #undef of a library macro to mitigate these problems. Tools, on the other hand, must cope with the inherent scalability problems associated with parsing the same headers repeatedly, because each different preprocessing context could effect how a header is interpreted -- even though the programmer rarely wants it. 24:00 Herb's experience with his iPad, his iPhone, and his Slate 7 with Win8. 28:45 We’re in two election seasons – (a) political and (b) technology (Nexus, iPad Mini, Surface, ...). Everyone is wallpapering the media with ads (some of them attack ads), and vying for customer votes/$$, and seeing who’s going to be the winner. CodeRage 7 is a free C++-themed online developer conference by Embarcadero, running from December 10-12 (Mon-Wed). Many of the sessions are vendor-specific, focusing notably on C++Builder, but there are two notable sessions likely of interest to C++ developers on all platforms. Bjarne Stroustrup will discuss the ISO C++11 standard, new language features, how C++11 builds on C++’s strengths, application portability, and C++’s ubiquitous presence in the markets. Why C++ is back and coming on strong, and not just for "infrastructure." Believe it.